Synthetic Worlds considers the remarkable alliance between chemistry and art, taking us from the late eighteenth century to the period immediately following the Second World War. Esther Leslie offers fascinating new insights into the place of the material object and the significance of the natural, the organic, the inorganic and the synthesized in this poetics of science. Through its dazzling innovations, which began in the nineteenth century, chemistry has granted new colours and surfaces, new substances, coatings and textures to the world. Often they are the result of accidents or the by-products of pollution. Chemistry has also invented simulants and surrogates for naturally occurring materials. Sometimes these developments confounded earlier alchemical and Romantic philosophies of science and nature, but, at other times, dynamic theories of chemical action combined with the emergent chemistry textbook orthodoxy. For example, the colour wheels of Goethe and Philipp Otto Runge, Hegelian theories of a spirit that inhabits dyes and ‘drives’ materials, and Romantic ideas of the weddings of substances influenced the experiments that boosted the successful German chemical industry after the 1840s. In turn, chemistry’s discoveries seeped back into philosophy and art. 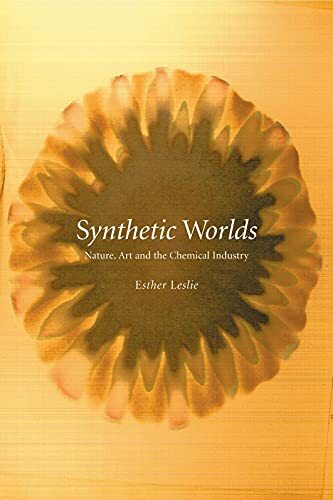 Esther Leslie’s Synthetic Worlds considers this and other startling affinities between chemistry, industry, aesthetics and art. Themes include the impact of artificial imitations and synthetics, the location of value, the mutability of substance, chemical fragility and artistic technique, the poetics of the inorganic and pollution, Bauhaus-influenced modulation and patina in art practice, and nationalist narratives of chemical breakthrough.